Meet The New Copperheads. They’re Also Called Republicans. Civil War-era Ohio Congressman Clement Vallandigham. Photo from Wikipedia. When it comes to expressions of patriotism in perilous times, silence is not golden. Among Republicans, John McCain clearly knows that. The sounds of silence coming from congressional Republicans in the wake of the indictments of twelve more Russian intelligence officers that have been forensically linked to the 2016 election debacle have been deafening. That’s why John McCain’s statement on the matter has become a singular sensation, for there is no one else in his party that is so demonstrative in putting country, rather than party, first in mind. It is becoming increasingly clear that the Republican Party has morphed into the 21st-century version of the Copperheads, the disloyal faction of the Democratic Party that was sympathetic to the South during the Civil War. The deafening silence of Mitch McConnell, Paul Ryan and other Republican leaders after the latest wave of Russians being charged in their role of sabotaging our democratic process is telling. [The] indictment is a result of the hard work of America’s law enforcement and intelligence officials who dedicate their lives to bringing to justice those who wish to do us harm. 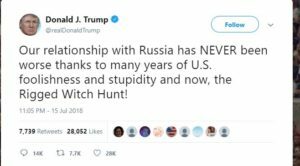 These revelations add to a body of evidence confirming an extensive plot by Vladimir Putin’s government to attack the 2016 election, sow chaos and dissension among the American electorate, and undermine faith in our democracy. And despite repeated warnings from our nation’s top intelligence and military leaders, the Kremlin’s efforts to weaken our institutions have continued unabated with insufficient action taken by the administration or Congress to strengthen our cyber defenses, safeguard our election systems, and deter further destabilizing activities. “… [W]ith insufficient action taken by the administration or Congress…” As one who would give all due respect to McCain, this is the most diplomatic language one can imagine in describing the leader of his party and his colleagues on The Hill. When it comes down to silence about the Russia investigation and obstruction of the work of special counsel Robert Mueller, modern-day Republicans by their silence as well as combativeness resemble the behavior of Clement Vallandigham, the Civil War Ohio Congressman who was sympathetic to the Confederacy while the American Republic was under siege during the darkest period of our history. A prominent leader of the anti-war “Peace Democrats” (or Copperheads), Vallandigham was arrested on May 5, 1863, and charged with “publicly expressing…his sympathies with those in arms against the Government of the United States”. At the very least, the Ohio congressman was disloyal to his government during a time of crisis. One wonders if there are any parallels to what is happening in today’s Republican Party. But then you don’t have to look too hard to see newly-minted versions of Copperheads nearly everywhere. “I was disappointed but not surprised. It seemed they had decided by then that they didn’t care who their nominee was, how he got elected or what effects having a foreign power influence our election would have on the nation, as long as they won,” Clapper wrote. Nearly two years after Obama’s request for Republican support in calling out Russian aggression, the silence of McConnell and Ryan continues, even as Trump, in a tweet on the eve of his meeting with retired KGB Colonel Vladimir Putin, blamed his own country for the low state of good relations. Never mind that a duly constituted American grand jury, overseen by a federal judge, indicted twelve Russian intelligence officers for their efforts in subverting our country’s democratic system. Never mind that Dana Rohrbacher, a Republican congressman from California, met with WikiLeaks head Julian Assange to help mediate his legal difficulties with the U.S. government. And never mind that Republican members of the House Oversight and Judiciary Committees, including such well-known ogres as Darrel Issa, Trey Gowdy, and Louie Gohmert went out of their way to slime FBI counterintelligence officer Peter Strzok, who spent a career counteracting Vladimir Putin’s KGB and GRU, the Russian military intelligence arm that was the major player in the hacking of the Democratic presidential campaign. Oops, I left out another name from that cast of slimers who are working hard to rebrand the Republican Party as our modern-day Copperheads. In this case, his loud and shrill voice is the opposite of the deafening silence coming from McConnell and Ryan, but it serves the same purpose. Meet the new Clement Vallandigham, who, like the 19th century Copperhead leader, also calls Ohio home. His name, of course, is Jim Jordan, the coatless cur of Congress. This week, Vallandigham’s ghost in the guise of Jordan displayed yet again his Copperhead status by working hard to bring an article of impeachment against Rod Rosenstein, the very individual who hired special counsel Robert Mueller in the first place. Yes, John McCain got it right even before his most recent announcement. 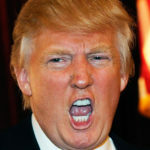 In 2008, his presidential campaign slogan was “Country First.” In the annals of history, Mitch McConnell, Paul Ryan, Dana Rohrbacher, Darrel Issa, Trey Gowdy, Louie Gohmert, Vallandigham heir Jim Jordan, along with a long list of other Republicans – let alone Donald Trump – will be judged for getting that terribly wrong. What a basket of deplorables, a cornucopia of terribles. Behold, let us identify them. They call themselves Republicans. In fact, they are the new Copperheads. What an interesting way to shoot yourself in the, um, foot. 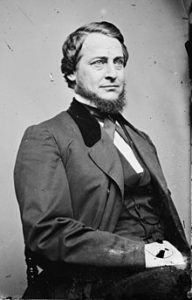 Does the ghost of history and Clement Vallandigham offer a similar fate to Jim Jordan and the rest of the new Copperheads, formerly known as Republicans? Postscript 2: At the time this article was completed, House Speaker Paul Ryan issued a brief statement about the role of the Russians in the 2016 election. He must have known this article was coming. Snicker.